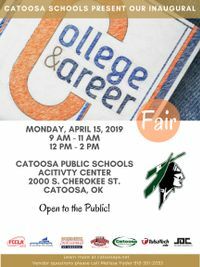 Catoosa Public Schools is proud to host our Inaugural College & Career Fair. This event is FREE and open to the public! The fair will bring local business and colleges from the local area and state. Guests can expect the opportunity to meet with vendors in regards to traditional college, career training and actively recruiting area businesses. This fair will also provide an opportunity to learn more about industry needs and training requirements. A current list of vendors can be found at www.catoosaps.net.